The Ye Olde White Harte prides itself as being the most historic Public House in East Yorkshire according to its website. 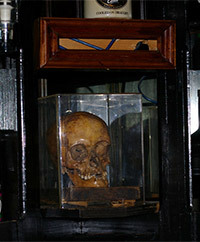 It certainly has an atmospheric interior - and that's before you set eyes on the skull on display (pictured left). The skull belongs to Freda, or at least it did in life according to one version the story. However, it is not known how old it is or if it belonged to a female. Consequently, there are a number of stories as to its potential owner. Some witness have reported the apparition of a girl in the bar area, leading some to speculate the skull belons to the spectral female. 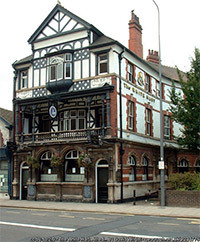 Pictured above are the exterior of the pub and the skull courtesy of David Wright. Kingston upon Hull, usually abbreviated to Hull, is a city in the East Riding of Yorkshire, England. It is located approximately 17 miles from Hull. Pictured left is the Humber Bridge courtesy of Ranveig. Licensed under CC BY-SA 3.0 via Wikimedia Commons.